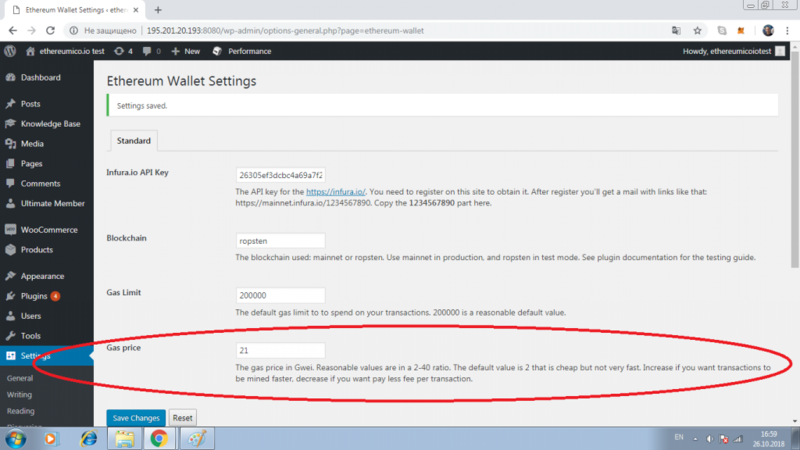 The Ethereum Wallet Configuration settings described in detail here. Learn how to configure the WordPress Ethereum Wallet plugin settings. We will use the TSX test Token smart contract deployed in the Ropsten test network in this section. You can do the same to check your configuration, and change it to your own token contract later, or use it from the ground. You can use the Crowdsale Contract and ERC20 Token Development Service to delegate smart contracts development to us. The API key for the https://infura.io/. You need to register to obtain it. The detailed instructions on how to get the infura API Key is here. This infura API is used to communicate with the Ethereum blockchain. It can be skipped while testing, but you are highly encouraged to set it in production to control API rate limits. The blockchain used: mainnet, ropsten or rinkeby. Use mainnet in production, and ropstenor rinkeby in test mode. It is the maximum amount of Gas to be used by your investors in an ERC20 token or Ether send operations. The default 200000 is a reasonable value for most of ERC20 tokens. Increase this value if your ERC20 Token contract requires more Gas. It is the case if your transactions fail with Out of gas error. It is the maximum amount of Ether to pay for a 1 Gas unit in Gwei. The actual Ethereum Gas price is auto adjusted according to the etherchain.org API. It means that the actual gas price would always be less or equal then the value set here. It would never be more. The default value of 21 Gwei is reasonable in most cases. This value would be used to form send Ether or ERC20 tokens transactions.